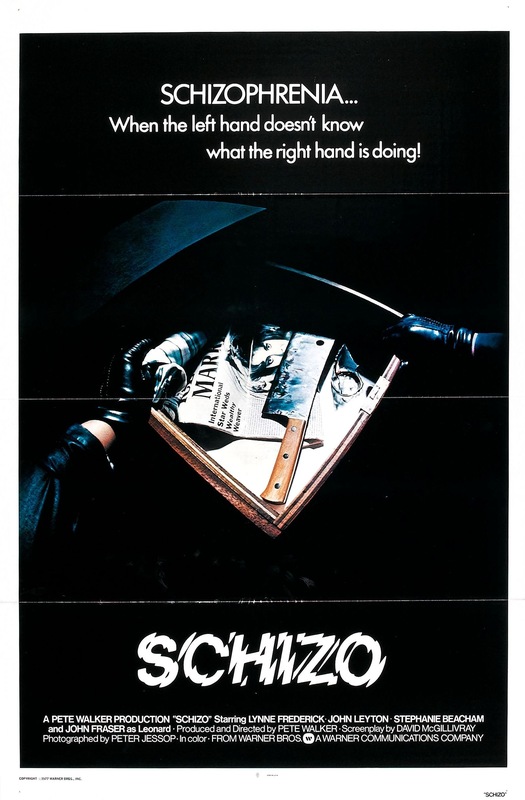 Released in 1976 Schizo, which also goes under the title Amok is an early example of the still developing slasher film, while I wouldn’t really label this a slasher flick for the most part, it does feature many elements we would later see in slashers and had this been made a few years later it probably would have turned out a lot different. Samantha (Frederick) and Alan (Leyton) are set to be married and when William Haskins (Watson) finds out he grabs a knife and gets on a train to where Samantha is. Not long after arriving he begins to follow Samantha and soon the bodies begin to pile up. Samantha tries to tell people about possible danger, but no one seems to take her concerns seriously. The screenplay by David McGillivray has the right ideas, but it just takes a little too long before it gets into more detail; the characters are mostly faceless and barley developed and in general not the most interesting bunch. While not poorly written it just seems as if there was more that could have been done with the plot. The twist ending I sort of figured out from the beginning and I can’t say why since I don’t wanna spoil anything, but it was a pretty good twist and the ending strays from the typical ending we get in these films. We’ve seen movies like this before and done better, but its just the first half of the script that kinda sinks this. Director Pete Walker delivers a sluggishly paced movie and from the start, Walker never really sets any kind of tone for the movie. The stalk scenes fall flat since it takes too long to establish the history between the the characters and while this may be more on the writing than direction, but regardless Walker doesn’t really get much out of the stalk scenes at least in the first half of the film. The pacing is always an issue, but does pick up a bit in the 2nd half and Walker also delivers some excellently staged murders with some nice suspense, but its just a whole the pacing is a little too sluggish and outside of the death scenes the suspense falls a bit flat. The death scenes as stated are well staged and quite violent and this does slightly make up for the sluggish pacing. Overall Schizo isn’t by any means a bad movie and don’t let my rating fool you. The 2nd half of the film is actually pretty good, but the film gets off to such a sluggish start I did kind of zone out at times. Upon another viewing I could easily change my rating to a 3 or even higher since I think this might be a film that grows on me. The death scenes are actually very well done with some brutality and suspense, but again its just the other areas where the suspense kind of falls flat. Schizo is a decent watch, but could have been a lot more.